In 1914 and 1915, Cracker Jack created one of the greatest baseball card sets ever seen. To this day, it remains a mystery why a company so interwoven with the game of baseball would walk away from producing baseball cards. Last year, Topps honored the gorgeous 1914-1915 set with a stunning recreation featuring today's stars. And this year, Topps has teamed with Cracker Jack to take care of some unfinished business. Until now, collectors could only imagine what a 1916 set would look like. Look no further. To carry on the legacy, Topps is pleased to announce 2005 Topps Cracker Jack Baseball. The 240-card base set features Veterans, Prospects, Rookies and the World Series Managers with 40 of the cards being short printed (1:3 packs). All parallels are 2 x 3 inches just like the original Cracker Jack cards. **Autographs - including 20 different Secret Surprise Signatures and 11 different Cracker Jack Autographs (#'d to 50) featuring Topps Exclusives BARRY BONDS (#'d to 25) and ALEX RODRIGUEZ. **Relics - includes 84 different "Take Me Out To The Ball Game" Relics featuring exclusives BARRY BONDS and ALEX RODRIGUEZ & six different "1, 2, 3, Strikes Your Out" Relics. Each 9-card pack carries a $3.00 SRP and includes 7 Base Cards, 1 Mini Parallel and 1 Secret Surprise. Each box guarantees 2 Memorabilia Cards, which include Relics and Autographs! 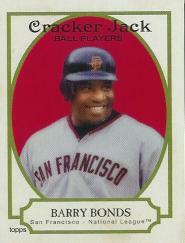 2005 Topps Cracker Jack releases the week of April 4th.